Choose a charming and allows you to combine the charm of Tuscany comfortable accommodation with all the precautions to spend a romantic holiday, along with his soul mate, without having to worry about anything. A quiet and cozy atmosphere to relax and share unforgettable moments of torque while outside awaits the ideal scenario: between nature and culture, sea and history, woods and art, spas and good food, Tuscany is a fascinating place that always reveals hospitable towards all, especially towards the lovers. Not far from the lush and enchanting Monte Amiata, near Arcidosso and Castel del Piano, among the pleasant provinces of Siena and Grosseto, nestled in the quiet atmosphere overlooking the Val d’Orcia, the farm La Dragona awaits between the rows of vines and the olive trees of the farm, located on the estimated Tuscan hills to ensure you a memorable stay long, in a romantic farmhouse in Tuscany set in an ancient farmhouse completely renovated and refurbished. Every year reserve of pleasant surprises: from soft spring colors to bright autumn colors, the summer harvest pampering winter; in every season, a holiday in Tuscany deserves to be lived to the fullest. For this reason, the farm La Dragona we have taken steps to prepare and furnish the interior ensures a satisfying experience even when returning from your small daily discoveries. Unveiling the possibilities and the goodies that Tuscan reserve, in fact, is an engaging and rewarding to which we have reserved a result bewitching and relaxing in our farm: the four large apartments and functional studio are treated in detail. With names inspired by the great artists of the past, whose main structures are reproduced on the walls, the apartments all have individual entrances and terrace for exclusive use; inside, private bathroom, bedroom for two, four or six people, equipped kitchenette, dining room equipped with a table, sofa and TV, you will enjoy an experience of total independence while on vacation. When the temperature permits, a bath in the large outdoor pool overlooking the incomparable natural landscape is the ideal break before you get involved from the other new sensations in your holiday in Tuscany. 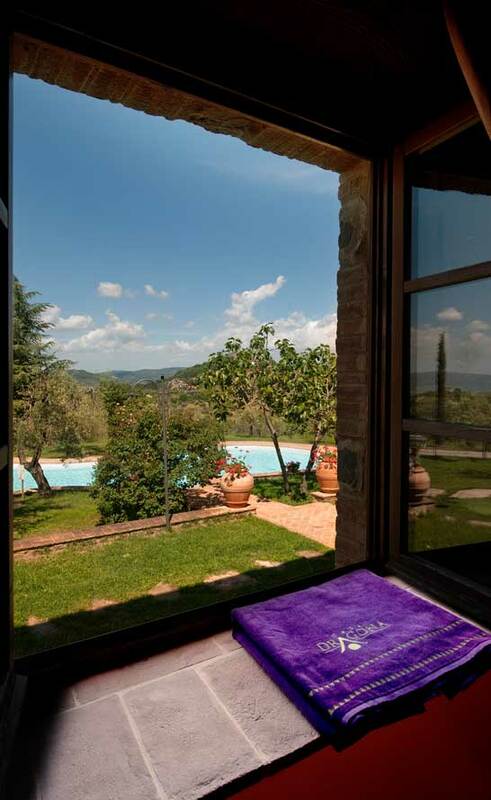 For suggestions and new ideas you can always count on our knowledge: the farm La Dragona will do our best to make you feel the proverbial Tuscan hospitality, adding to a fascinating place that something more than just a charming and offer.